Contos, A., Francis, A. and Fyfe, J. 2019. Building a safe recycled water scheme. In: J.B. Rose and B. Jiménez-Cisneros, (eds) Global Water Pathogen Project. http://www.waterpathogens.org (S. Petterson and G. Medema (eds) Part 5 Case Studies) http://www.waterpathogens.org/book/building-a-safe-recycled-water-scheme Michigan State University, E. Lansing, MI, UNESCO. Project driven by a need for climate resilient water sources, improved green spaces, low carbon water and resilient infrastructure. determine the required pathogen reductions for the reuse of effluent for irrigation of sports fields, golf course and community open spaces. Select and design the appropriate process units to achieve the necessary pathogen reduction. The town of Parkes is located in central NSW, approximately 400 km west of Sydney. The town of 12,000 undertook an upgrade of their sewage treatment system. 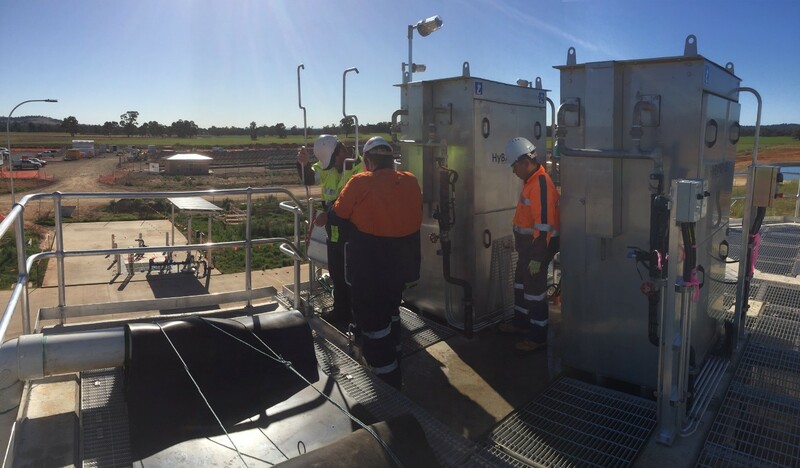 As part of this project Parkes Shire Council (PSC) has been exploring opportunities to recycle water throughout the town. A recycled water strategy explicitly mapped the links between the SDGs including climate resilient water supplies, improved green spaces, low carbon water and resilient infrastructure. Parkes Shire Council analysed water sources and use options to optimise the supply and demand of water throughout the town to maintain industry, urban green spaces and supply potable water. An integrated water management study investigated options including stormwater, recycled water, bore, dam and river water. The preferred option for recycled water was to use it for irrigation of community open spaces including golf course, horse racetrack and sports fields. Higher exposure uses such as commercial car wash and schools (including eco-gardens) were considered but not selected in the strategy due to their higher treatment requirements and low demands. Pathogen reduction values for municipal irrigation were selected from the Australian Guidelines for Water Recycling (AGWR, 2006 – see case study 3.2). Considering exposure to facility users and the community the required log10 reduction value for campylobacter of 3.7, rotavirus of 5.2 and Cryptosporidium of 4.0 were determined. Having established the pathogen reduction requirements, a range of technology combinations including membrane, UV and chlorination were evaluated to meet these requirements. By determining the end users prior to the recycled water plant design, pathogen reduction targets could be explicitly established and unit processes selected to specifically meet the required pathogen reductions. A multi-disciplinary team including designers, operators, managers and a water quality specialists team engaged in a series of facilitated risk workshops covering process risk, water quality risks, constructability, operability and maintainability. In addition to secondary treatment, chlorination and UV were selected to achieve the required removals. Chlorination was designed to achieve a minimum 4 log10 reduction of virus and bacteria. UV was designed to achieve 4 log10 reduction of Cryptosporidium and 2 log10 virus (Adenovirus Type 40). Real-time monitoring parameters of chlorine contact time and UV dose were selected to monitor the critical control points necessary to assure recycled water safety. Understanding the end user requirements for the recycled water allowed pathogen reduction targets to be established at the project outset. The treatment train could then be selected to efficiently and effectively meet these targets. The multidisciplinary team, including operator involvement in design provides a high confidence that the plant can both treat the water safely and provide the operations staff with real-time information on water safety. Read more? Scroll down for a more detailed case study description.